Sometimes life is all about lemons and the way we roll, especially if want to know what stops us from moving forward. Shout out to my Columbia grad students. After an intensive “pie is better than cake” discussion in class, we’re on to explore whether limes are better than lemons. And no, this won’t be on a quiz. Our housing market research for 2 Connecticut markets were published this week by real estate firm Douglas Elliman, the 3rd largest real estate brokerage in the U.S. This is part of an expanding Elliman Report series I have authored since 1994. 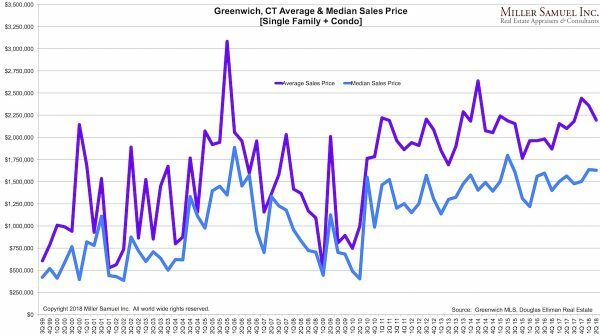 Nearly two years ago, Barry Sternicht of Starwood pronounced Greenwich, CT the worst housing market in the U.S. (relating to incorrectly pricing his own house). 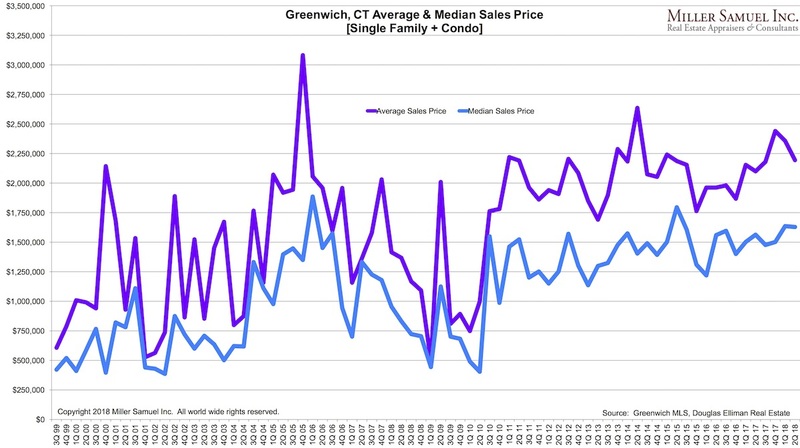 The Greenwich housing market showed fairly solid housing market metrics this quarter with rising sales and prices. In contrast to 2016, the luxury market saw declining inventory for the seventh consecutive quarter on a year over year basis. The market never saw the boom that New York City did and as a result, wealthy titans of industry became disconnected from local market conditions. 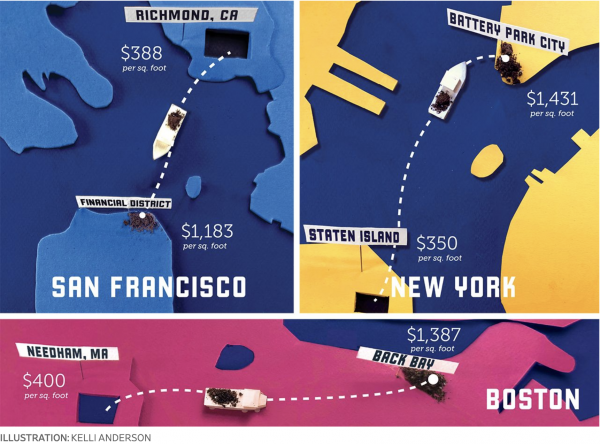 Apparently Wall Street loves reading about Greenwich, CT including when the news is good. The Bloomberg story referencing our research was the 6th most-read story of the day on the 350K± Bloomberg Terminals. Here’s a thought. Start thinking about more cross-border competition between adjacent affluent Westchester County, NY and Fairfield County, CT. There is a big difference between property tax/SALT exposure. I realize that wealthy people don’t exclusively buy homes for their tax exposure but it will force sellers to be more cognizant of their home values before and after the new federal tax law. 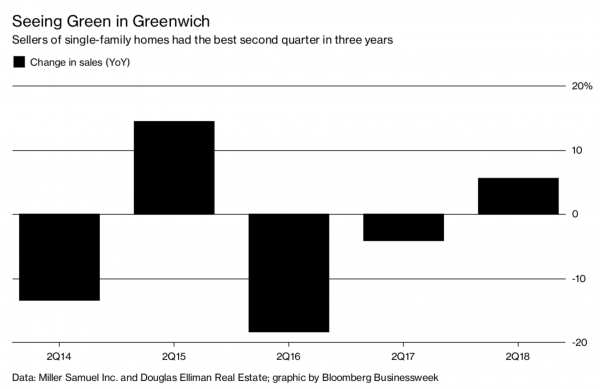 The Elliman Report for Fairfield County Q2-2018 was also public this week (for out-of-towners, this is the county Greenwich sits within). Here are a few charts from our chart gallery. 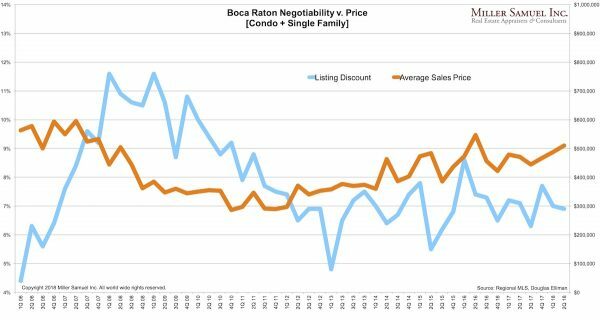 Douglas Elliman published our South Florida research this week through eight reports covering even more markets. Interestingly, all markets generally experienced uplifting report results, much like Greenwich, CT did to the north. This is a low tax region of the U.S. that is beginning to anticipate benefits from the new federal tax law that may draw buyers from higher tax regions like New York state. The links to the reports are presented at the bottom of this newsletter. Here are a few of the regional charts in our chart gallery that stand out. There was a bombshell Miami Herald story this week: How dirty is Miami real estate? Secret home deals dried up when feds started watching on the impact of the U.S. Financial Crimes Enforcement Network (FinCEN), an agency within the U.S. Treasury to stop money laundering efforts that use real estate as the vehicle. The original temporary rule came out in January 2016 about a year after the luxury new development began to tank around the U.S. from a stronger U.S. dollar and significant overbuilding. My initial criticism towards their action was the difficulty it would be to relate effectiveness versus market deterioration. However their strategy has changed and the limits aren’t being published, making it harder to game the process. For example, the threshold for scrutiny in Miami-Dade County is $300,000 now but this is not published in the usual places. 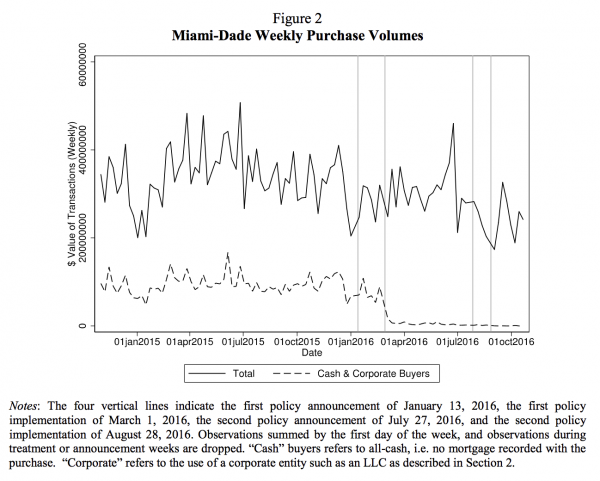 The driver of the Miami Herald story was the publication of a research paper from the New York Fed and the University of Miami that attempted to measure the impact to the market. The lower dotted line represents cash buyers through LLCs. 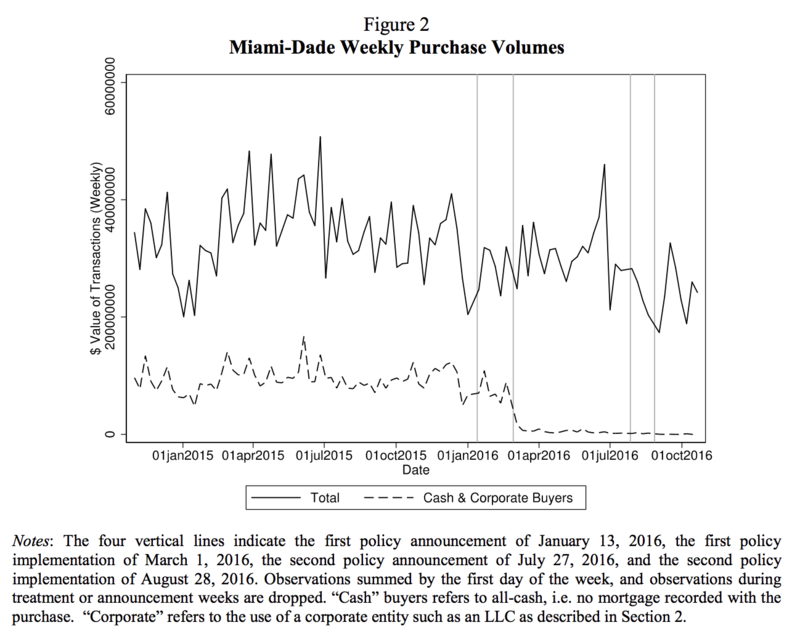 By the second policy announcement in July 2016 (2nd vertical line), sales collapse. Before the second policy announcement, the purchase volume seems artificially flat when compared to the overall market above. The flat line after the second vertical line is unusually flat. If I were a billionaire and buying a $5M home for my son, I would absolutely use an LLC to protect their privacy and reduce the risk of letting others know where he now lives. FinCEN logic suggests that only criminals buy homes for cash and now that practice has collapsed. And then using my example of privacy as a driver for this financial vehicle, the low flat line after the second vertical line is the remaining uses of this technique and represented very little of the pre-notice buyer pool. No. A billionaire is surrounded by high-quality financial advisors and lawyers and would likely advise me not to buy with this popular method anymore and they would devise a workaround. In other words, the drop off of LLC cash buyers after the second notice is – I believe – significantly overstated. I’m not sure the Feds appreciate how hard the wealthy strive for privacy in real estate transactions. One other thought now that the cash threshold for the county has been dropped to $300,000 in May, the Miami Beach market is seeing significant improvement. There are more condo sales, an apparent skew to larger sales and rising price trends market-wide. This formed the premise of a fun Wall Street Journal piece powered by NeighborhoodX (I’m an advisor) about the creation of new land for housing and how this process creates value. The article talks about how Battery Park City was created by sand dredged and moved from Staten Island (and it was also more famously taken from the excavation for the World Trade Center and other construction projects). Incidentally, it is important to understand the basic concept that property appreciation runs with the land. The improvements (i.e. the house) depreciate. The pattern is fairly consistent. 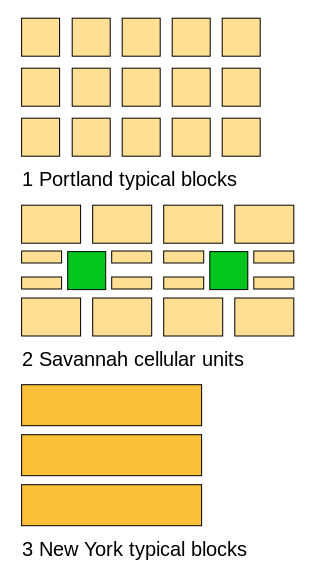 To take it a step further for Manhattan, the Commissioner’s plan of 1811 enabled a “grid plan” from 14th Street northward to Washington Heights. While criticized by some as “boring,” many say this was key to the exponential economic growth of the city. 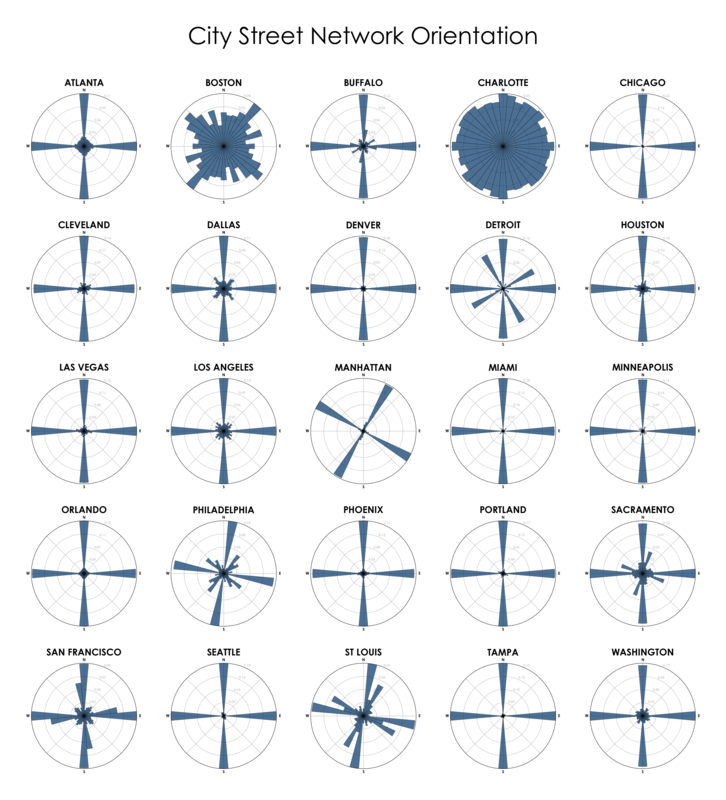 And “grid plan” used by cities varied in design. BONUS – Here’s a handy walker’s timing rule for the blocks of NYC I learned while appraising roughly 8,000 condos, co-ops, and townhouses during my (still ongoing) 32+ year career. North/South: 1-minute per block (10-block walk takes 10 minutes). Website 27east.com that chronicles the Hamptons housing market, went all “arts & crafts” on me and colorized some inventory data I gave them. 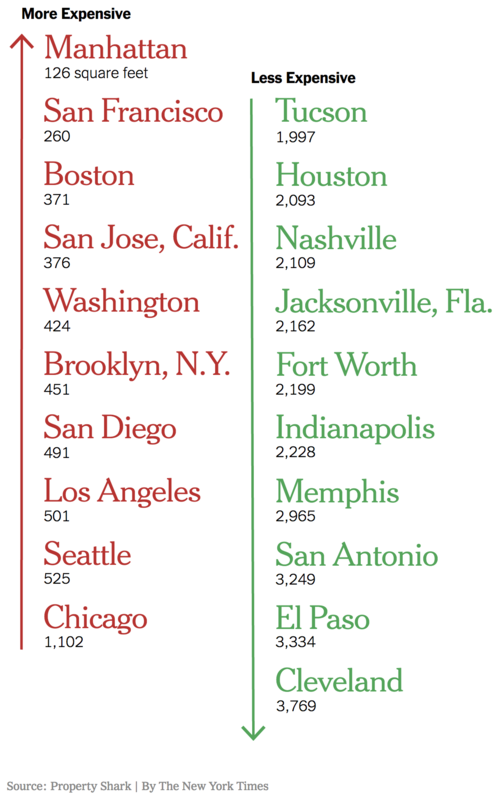 There was a fun infographic in the NYT Real Estate Section showing that Manhattanites get 126 square feet for $200,000 (roughly the U.S. median home price) while Clevelandites (aka Clevelanders) get 3,769 square feet for the same price. First of all, Manhattanites are seldom in their apartments because there is so much to do and see. And secondly, you can buy strawberries on nearly every other block at 3 am. Who wouldn’t be willing to pay Manhattan prices for that? I took a hiatus this week from Appraiserville as I pumped out a heavy dose of market research, so I’ll leave you with this deep thought. Back on the saddle next week. And I’ll buy strawberries at 3 am just to say I did).